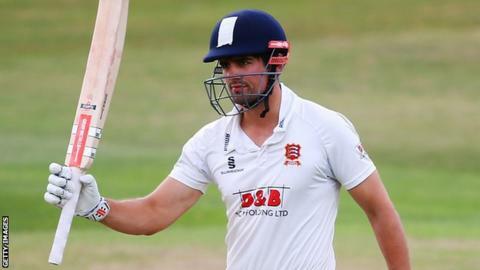 Former England Test captain Alastair Cook has been made available by the England and Wales Cricket Board for Essex's three opening County Championship games of the season. Cook will also be able to play in Essex's first three One-Day Cup games. Lancashire opening batsman Haseeb Hameed and Durham's Keaton Jennings are available for all fixtures. Hameed made his Test debut against India in November before being replaced by Jennings after breaking his hand. New England captain Joe Root, Yorkshire teammate Jonny Bairstow, Worcestershire's Moeen Ali, and Nottinghamshire seamer Jake Ball will miss their sides' first Championship games. Root, Bairstow and Ali will play only one first-class match, though all four will be available for three One-Day Cup games. Cook's first match for Essex since resigning the England captaincy in February will start on 7 April against Lancashire, who will also be able to include England's record Test wicket-taker, Jimmy Anderson. James Anderson (Lancs): County Championship v Essex (7-10 April), v Somerset (21-24 April); One-Day Cup v Leicestershire (28 April), v Yorkshire (1 May). Moeen Ali (Worcs): County Championship v Northamptonshire (21-24 April); One-Day Cup v Nottinghamshire (27 April), Leicestershire (30 April) and Northamptonshire (3 May). Jonny Bairstow (Yorks): County Championship v Hampshire (21-24 April); One-Day Cup v Nottinghamshire (29 April), v Lancashire (1 May) and Durham (3 May). Adil Rashid (Yorks): County Championship v v Warwickshire (14-17 April), v Hampshire (21-24 April); One-Day Cup v Nottinghamshire (29 April), v Lancashire (1 May) and Durham (3 May). Joe Root (Yorks): County Championship v Hampshire (21-24 April); One-Day Cup v Nottinghamshire (29 April), v Lancashire (1 May) and Durham (3 May). Available for all matches: Keaton Jennings, Mark Wood (both Durham); Alastair Cook (Essex), Liam Dawson, James Vince (both Hampshire); Haseeb Hameed (Lancashire); Steven Finn (Middlesex); Ben Duckett (Northamptonshire); Alex Hales (Nottinghamshire); Gary Ballance, Liam Plunkett, David Willey (all Yorkshire).